In Bilaspur, the game between Services and J&K was called off due to rain. Services' openers put on 43 before Anshul Gupta was out lbw to Jammu & Kashmir's Ram Dayal. In only his second List A match, wicketkeeper Devender Lochab came in and guided the innings with a timely 81, bringing up a maiden fifty in the process. Yashpal Singh supported him with an unbeaten 53. Dayal was the pick of the bowlers for J&K with 3 for 52. When Irfan Khan was caught to bring the score to 255 for 7, rain intervened, and prevented any further play. 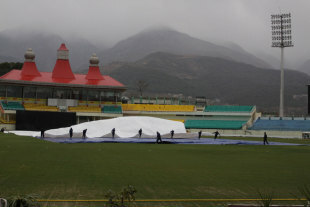 The match between Delhi and Punjab in Dharamsala was also called off due to rain. Delhi batted first against Punjab, with opener Dhruv Shorey scoring a maiden List-A half-century, as he finished not out with 54, before rain intervened. Delhi lost wickets at regular intervals, with Punjab's Rahul Sharma picking up two wickets to leave Delhi at a vulnerable 132 for 6 in the 30th over. When they were at 142 for 6, rain began to fall as the players were asked to come off. Haryana's innings was interrupted by rain as they put on 138 for 4 in 32.2 overs against Himachal Pradesh. Haryana lost wickets at regular intervals, with Rahul Dewan left unbeaten on 45 when rain began to pour and the match was called off by the umpires. Vidarbha won a rain-affected thriller against Railways by one run, via the VJD method. Vidarbha elected to field, with Railways opener Amit Paunikar scoring an unbeaten 150, his career-best performance in List-A matches. With Paunikar providing the backbone, Railways strung together useful partnerships throughout the innings, as Railways finished 242 for 6. Shrikant Wagh was the pick of the bowlers with 3 for 59. Akshay Kolhar led the way for Vidarbha with 90 off 107 balls. He put on 67 runs for the third wicket with Hemang Badani, before adding a further 71 with Shalabh Shrivastava. When rain intervened in the 46th over, Vidarbha proved to be one run above the par score of 212, thereby securing a one-run victory. A collective batting effort from Madhya Pradesh's middle order ensured they beat Uttar Pradesh by five wickets. UP were sent in to bat, and found themselves at 11 for 1 before Suresh Raina and Eklavya Dwivedi put on 64 runs for the second wicket. Mohammad Kaif struck 55 as they finished 205 for 9 after the completion of their fifty overs. Anand Rajan played an instrumental role as he picked up a career-best 4 for 51. For MP, Jatin Saxena's 45 was the highest score of the innings, and was backed by Rameez Khan's 36, Udit Birla's 44, and Harpreet Singh's quickfire 41 off 28, as they reached home in the 40th over. Gujarat achieved an eight-wicket victory against Mumbai in Pune. Mumbai were bowled out for 132, thanks to the combined efforts of Gujarat's bowlers. Put in to bat, openers Wasim Jaffer and Sushant Marathe put on 72 runs for the first wicket. But Mumbai lost nine wickets for 60 runs thereafter. Three Gujarat bowlers ended up taking their career-best figures in the match. Akshar Patel picked up 4 for 24, and was ably supported by Jesal Karia's economical 3 for 21, and Mehul Patel's miserly 2 for 10 in just 7.1 overs. The Gujarat openers started strongly with wicketkeeper captain Parthiv Patel top-scoring with 49 as he put on a 91 run-stand with Priyank Panchal. Abdulahad Malik's 32 off 25 balls ensured Gujarat were able to finish off the game in the 25th over. A strong batting performance from Maharashtra saw them through to a six-wicket victory against Saurashtra in Pune. Chasing 235, the base was set by openers Vijay Zol and Harshad Khadiwale, with a 108 run-stand. The middle-order joined in with decent contributions to reach the target in the 38th over. For Saurashtra, Pratik Mehta top-scored with 73, and Chirag Jani scored 68. Andhra won a nailbiter against Hyderabad by two runs, they defended their 202 by dismissing Hyderabad for 200. Andhra won the toss and elected to bat as openers Srikar Bharat and Prasanth Kumar put on 52 runs for the first wicket. Once Ojha claimed Bharat's wicket, the team began to lose momentum as they stuttered to 92 for 5. Wicketkeeper Bodapati Sumanth and Gnaneswara Rao led a recovery with a 64-run stand for the sixth wicket. Ojha took 4 for 24 and was supported by Ashish Reddy's 3 for 52. Hyderabad stumbled to 40 for 4 in the 11th over in reply. Hanuma Vihari, along with Habeeb Ahmed, put on 82 runs for the fifth wicket to help stabilise the innings. Once they fell however, Hyderabad began to lose wickets as they inched towards the target. Paidikalva Vijaykumar wrapped things up, finishing off the tail with two balls left. Sahabuddin picked up his second four-wicket haul in as many matches. Tamil Nadu beat Goa by 92 runs, thanks to half centuries from Dinesh Karthik and B Aparajith. Tamil Nadu won the toss and elected to bat, but soon found themselves in trouble as they were 45 for 3 after 14.2 overs. Karthik was involved in two key stands, first worth 58 runs with S Badrinath, and 120 with Aparajith. Karthik scored 90, and Aparajith finished with a career-best 75, as Tamil Nadu scored 274. Goa, in reply, were pegged back by Sunil Sam's three wickets to be reduced to 58 for 3. Ravikant Shukla was the only batsman to cross 20 runs as he finished with 61. Aparajith took 2 for 36 as Goa slumped to 182 all out in 43.1 overs. Lokesh Rahul scored a career-best 86 to help power Karnataka to a 52-run victory over Kerala. Kerala won the toss and put Karnataka in with openers Rahul and Robin Uthappa putting on a 112-run stand. Contributions from Stuart Binny, who finished with 60, Ganesh Satish and Karun Nair helped propel the score to 322 for 5. Kerala's start was markedly different as they stumbled to 32 for 3. Robert Fernandez and Sachin Baby then put on 106 runs for the fourth wicket to help stabilise the innings. HS Sharath's 4 for 40 was instrumental in keeping Kerala at bay as they completed their fifty overs with 270 for 6.